I am a born fighter. I will fight for my rights, I will fight for what is right. As my father and my grandfather before me I stand for what is right. But sometimes we are nervous. The moment before the fight is the worst. I have fought many full contact fights, I have been tested for black belts in several styles, and the moment before the fight starts is the worst. I have tested in school for many years, high school, college, graduate school, the moment when you are sitting there waiting for the test to start is the worst. The anticipation is worse than the fight itself. I recall anxiously waiting for the black belt tests to begin. It seems to take forever. Once it starts it is difficult, very difficult, but it is fine. The waiting is the hardest part. The fight is good. And once the fight began I waited for the first blow, the first time you get kicked, the first time you feel a punch to your face. That is a great moment? Why? Are we sick individuals? No, we are not. It is a great moment because you have faced your fears, you have confronted the adversary and you have survived. You received a blow, perhaps some blood has been spilt, and you are OK, you are OK. The confrontation is good, it is healthy, it is the greatest healer and stress release. Before the confrontation you do not know what to expect; what does the enemy have? what are his weapons? This is true for a physical fight and it is true for war. When the war begins all secrets are revealed. Now you know what weapons the enemy has. Now you can deal with it. It is the same with personal issues. Someone is upset with you, a friend, a client, a family member. You have some idea but you don't really know. What is it? Why is this person so angry? What could it be? But when the confrontation comes, when the first blows are exchanged, now you know. Now you know what you are up against, now you understand what the core issues are, and now you can deal with it. Now you are alive and well again. Confrontation is communication, and communication leads to healing and understanding, understanding leads to conflict resolution. Never avoid the conflict, never avoid the confrontation. There are two areas in my life where I have experience this full force; fighting and Talmud study. Fighting and Talmud study? Now that might sound like a contradiction, only to the uninitiated. Fighting is not always about violence. Intellectual and spiritual arguments are not always calm. We get excited about the things we care about. Talmud study can be a NHB (No Holds Barred) fight. Scholars will argue a point regarding a discussion that took place between two rabbis who died two thousand years ago. The debate will reach a high volume, scholars will pound their fists on the table (shtender) and raise their voices, all for the sake of the truth. At times harsh words will be spoken. But in the end, as in the end of any bout, or match, the sides will shake hands or embrace. You see, that no holds barred discussion brought everything out in the open, as we say in Israel, open cards. Everything was laid out on the table. When everything is open real communication takes place, voices might be raised by everything is out in the open, nothing is left unsaid. This is how conflicts are solved. Physical fights are the same. No holds barred, everything is out there, you see what the other guy's got. Once you know what tools and weapons he has, you can deal with them. But there is one condition, both sides must be reasonable people, ruled by logic and not emotion. Once emotion takes charge, all bets are off. 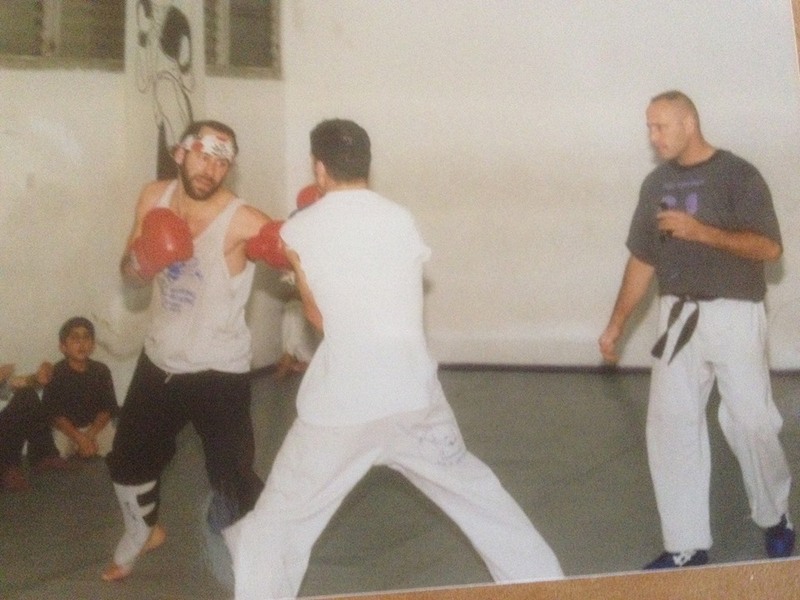 Moshe Katz, testing for black belt under the guidance of Itay Gil, still a close friend. Those were very rugged conditions, good times.